Roadrunner I.T. Solutions provides complete, computer or data network tech support. Whether your files are slow to open or your server freezes up daily, we know how to diagnose the issue, troubleshoot it and provide a fast, effective solution. Many offices and home users have a wireless network these days, but often, these can pose security issues – and you might not even know it. If your network isn’t properly secured, you could be broadcasting your data like a radio station, allowing anyone with a small amount of experience in computers and networking to discover your data, personal information and more. If they wanted, they could even take over your network and lock you out of it in seconds. At Roadrunner I.T. Solutions, we ensure this won’t happen. Not only do we help you design and set-up the perfect network implementation, we also help you secure and safeguard it, too. Your data is safe with Roadrunner I.T. Solutions on your side. If your network wasn’t set up by an absolute pro, chances are there are some kinks that need to be worked out – particularly in the server room. Mixed up, messy cables and server configurations can make troubleshooting your computer issues impossible, and they can be difficult to maneuver and get around, too. We can help with this. 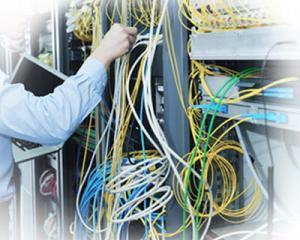 We’ll clean up your network set-up, label your cable runs and make troubleshooting and managing your systems a breeze. Organizing these cable runs may help in another way – If you happen to have a sound system in your network (one that broadcasts audio to the surrounding area), it is possible that if the cables are run incorrectly, you could have audio running down your data line. This would cause a number of big issues, including corrupted data, dropped network connectivity and more. Have a network with newer, faster standard cables, but can’t figure out why your speed is crawling at a snail’s pace? We’ll inspect your network and find out where those unwanted bottlenecks are. Then, we’ll devise and implement the most effective solution. In the end, you’ll have a network that runs at blazing fast speeds. No more waiting or wasting time for you! Do you want employees to be able to access files and servers even when they’re not in the office? In order to do this securely, you need a safe VPN connection in place. A Roadrunner I.T. Solutions tech can assist with this, setting up a secure network connection that links remote workstations with your main network infrastructure. Through this, your team members can access and share files securely, without ever putting data or information at risk. If you want fast, accessible, friendly and reliable network support, then Roadrunner I.T. Solutions is your answer. With convenient on-site and online tech support services, you don’t need to go anywhere else to get your computer, the components around it, or your network repaired. Just give us a call, and we’ll have your issues fixed in no time.